Admittedly, even if you follow all of the steps below to perfection, you may not be able to garner 50 thousand views because everyone is beholden to SlideShare. Whether or not it chooses to feature your slide deck on its homepage has a lot to do with your ability to attract that many eyeballs. However, the steps below will increase the likelihood of being featured on the home page. You’ll get to watch the views, downloads and embeds pour in if that happens. 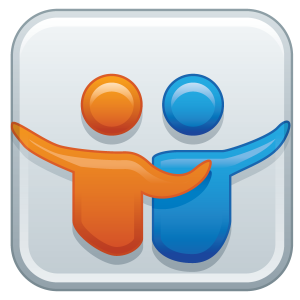 Title – Your title is critical to capturing the attention of SlideShare, its users and for showing up in search. It should provide a clear value proposition. Creativity and controversy in titles can help drive attention, too. Relevancy – The topic of the presentation should be relevant to the challenges of the industry you’re presenting to. It should be timely and possibly trendy. If your topic was discussed in the recent news cycle, you know it’s relevant. Quality Content – Obviously, quality is in the eye of the beholder, but if the content is full of unique facts, actionable takeaways and backed up with real experience or research you potentially have a winner on your hands. Simple Slides – This rule is the most broken by presenters. Each slide should tell a story, but it should do so with little text and/or easy-to-understand graphics. You want people to focus on your speech more than trying to decipher the 20 bullets on each slide. Graphic Design – Well designed slide decks are appealing to SlideShare as well as your audience during a presentation. If you’re lacking in the graphic design skills department, consider drafting the skills of a professional designer. Social Media – The easiest way to get on SlideShare’s home page is to have your presentation tweeted, liked or shared several times. There is no specific threshold; however, your deck needs to be in the top nine slide decks shared on Facebook, Twitter or LinkedIn at the time SlideShare updates its “Hot on. . .” sections. Never expect to hit a homerun every time you publish a new slide deck. 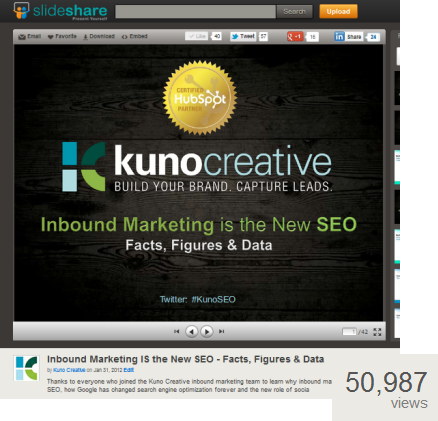 Kuno has been lucky enough to have four presentations featured on the home page of SlideShare. However, that’s after 35 tries, so our batting average is only .114. Consistently producing slide presentations that follow the above recommendations will give you the best shot at being featured on SlideShare’s homepage, driving thousands of slide deck views, building your brand and capturing leads.